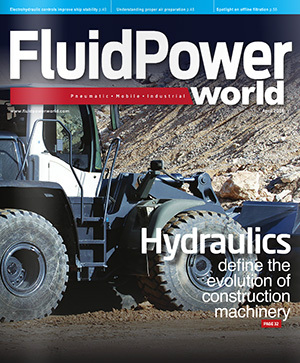 The upcoming IFPE show, in Las Vegas from March 7-11, will allow fluid power designers to see the latest in hydraulic hose. Read on to see what types of hydraulic hose are used in mobile machinery, as well as a listing of what IFPE booths you can visit for more information on them. All hydraulic systems require some type of plumbing, whether it’s pipe, tube or hose. These components transfer fluid throughout the system and are used heavily on mobile machinery. The most common conduit used on mobile machinery is hydraulic hose, particularly because these machines require plumbing that allows bending, flexing and constant movement. As discussed in several other recent posts, synthetic rubber hoses are most prevalent. These designs are usually strengthened with braiding of steel, but synthetic and textile braids may be used when a hose needs to be nonconductive. Additionally, thermoplastic hose may be used in extremely harsh environments where the hose needs to withstand abuse from corrosive chemicals or extreme temperatures. A hose’s pressure rating is based its inner reinforcement’s construction, and, if braided, on the number of braid layers. Two styles are available — braided steel wire with one or two reinforcement layers or spiral-wound steel wire. The most common designs available are the 100R1 and 100R2 construction types, with one or two layers of braided steel respectively. Standards created by the SAE for hose construction help determine which hose is compatible with certain fluid types, temperatures and pressures. The larger number of steel braiding, for example 4- or 6-wire, can withstand higher pressures, but these designs are usually stiffer. As a result, greater consideration of bend radius must be taken. Additionally, pressure drop can often be overlooked when selecting hydraulic hose. This can create excessive energy waste, so one must consider hose diameter in selection. Hydraulic hose may be constructed for the application it may be operating in, especially in extremely harsh applications. For example, hose for extreme heat or cold is designed to withstand breakdown and cracking. If an application requires a water-based fluid, it is wise not to choose a steel-braided hose, as this will cause internal corrosion and eventually failure. Finally, use nonconductive hose in applications that may be working electrical or utility applications, such as boom lifts or telehandlers.